Home EDUCATION MKU now gets the nod to teach law. MKU Chairman and Founder Dr. Simon Gicharu and Prof. Barnabas Nawangwe, VC Makerere University during their 14th Graduation Ceremony held at the Graduation Pavilion Grounds Thika- Garissa Road on Friday. The Council of Legal Education (CLE) which is the governing body mandated to oversee legal education and training in Kenya, has now fully accredited Mount Kenya University (MKU) to offer LLB programmes in its . This is after CLE inspected MKU’s Law School and were satisfied that they have fulfilled all the terms and conditions set to offer degrees in law. 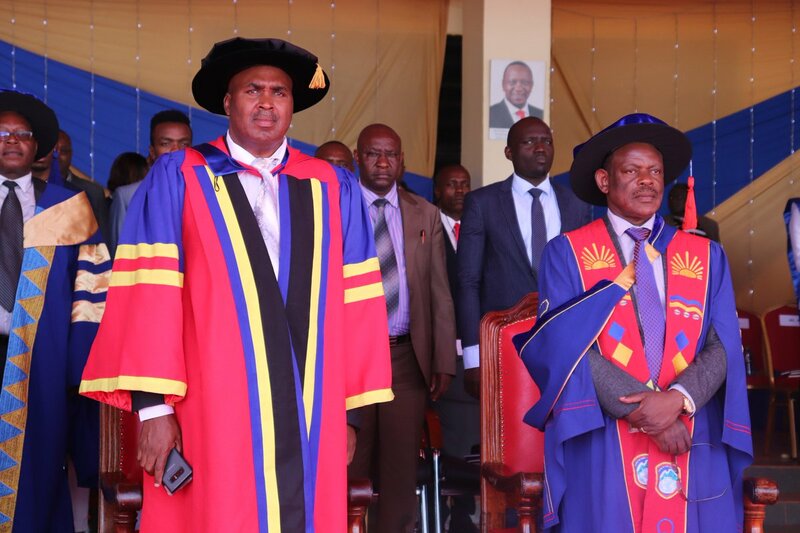 This was revealed by MKU Chairman and Founder Dr. Simon Gicharu during their 14th Graduation Ceremony held at the Graduation Pavilion Grounds Thika- Garissa Road on Friday. MKU therefore joins the 12 institutions that are allowed to teach law in Kenya. These are Riara University (main campus), Africa Nazarene, and University of Nairobi (Parklands campus) University of Nairobi (Mombasa campus), Kabarak University, Egerton University, Strathmore, Kenyatta University, Jomo Kenyatta University of Agriculture and Technology (JKUAT) and Catholic University. Gicharu took issue with a rise in people acquiring fake degree and college certificates, warning employers to be more vigilant when admitting new employees. “It is big challenge in Kenya. There are so many people walking around with fake certificates. I call upon employers to make a point of always verifying the authenticity of these documents from the issuing university so as to ascertain if they are genuine,” said Gicharu. The chairman also challenged universities and the government to embrace technology that would enable anyone who wished to access the data on legitimate certificates via online to be able to do so with just a click of the button. Concerning the current wave of schools unrest, Gicharu acknowledged that there existed a gap in both parenting and policy that needed to be bridge in order to arrest the situation. He called upon all stakeholders to join hands in seeking a lasting to the problem through research. “It (schools unrest) is a shame. I am calling on all stakeholders in the sector to thoroughly research on its root cause and come up with a lasting solution to the problem otherwise we are going to lose a whole generation. As an institution, we are very ready to offer our full support to see the end of this strikes and student indiscipline,” he said. Over 6,000 students graduated in various faculties. Gicharu challenged the graduants to exploit the resources in the country to be job creators rather than being job seekers, reckoning that Africa was so rich and all they needed was to think outside the box. The Guest Speaker Prof. Barnabas Nawangwe, VC Makerere University, emphasised the need for African countries to increase enrollment in university education if Africa was to break the chains of poverty and marginalisation. During the event, Prof. John Struthers was installed as the 2nd Chancellor of MKU.